The Space Shuttle in real life is huge. It looms over you like a brutishly beautiful tiled dart, all burned and blackened, silver grey and steam punked. I wasn’t ready for just how large it was as we walked through the hangar which itself is so vast its quite hard to photograph. A friend had kindly agreed to take me to the Udvar-Hazy Center in Chantilly, Virginia which is part of the Smithsonian and companion to the more famous Aviation and Aerospace Museum on the National Mall. 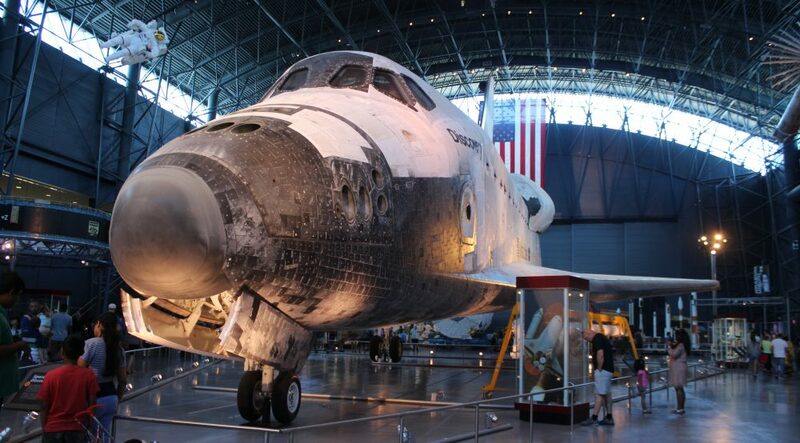 The Udvar-Hazy Center is located alongside Washington’s Dulles Airport where the Shuttle was flown in bolted to the roof of a Boeing 747 in 2012. The Center features both the Boeing Aviation Hangar and the James S. McDonnell Space Hangar where hundreds -nay – thousands of aviation and space goods are stored. The list is jaw dropping but the pride of place goes to both the Lockheed SR-71 Blackbird, a UFO for many years it emerged like an alien craft from the sixties, and the Space Shuttle. As you’ll see from the image above, it faces you as you walk into the Centre, and also facing you is the Space Shuttle Discovery, the last to glide back to earth. By its last mission in 2011 it had flown 39 missions into space spending a full year in total orbiting the globe 5,830 times. The first Discovery mission was in 1984 when I was studying to become a journalist, its 30 year history tracked by my life in various ways. How incredible in these throwaway days to stand below the much loved Shuttle and touch its hallowed tiles. This may sound a tad weird, however take a moment to think about the project. To build a machine capable of returning to earth under its own steam (albeit gliding) and landing on its huge undercarriage. In the years I tried to land the Shuttle using the X-Plane simulator, not once did I manage. The skill in hitting the exact angle to facilitate a re-entry is akin to surfing on a mini-board in 4 dimensions while wearing boots with roller bearings on their soles. Imagine the difference too in forethought and science between the 1984 generation and this generation of leaders particularly in the USA. Now private enterprise is driving the need to travel to Mars and beyond. Back to the Exhibition, where the curators have grouped planes into areas such as transport, military and even aerobatics which made for some interesting viewing. I’ve added a few vehicles here in an attempt to show just how extensive this centre is and to convince those powers who hold the purse strings (like my partner) that a return journey is necessary to complete this blog update successfully. The America by Air exhibition follows the growth of the federal government’s role in shaping the airline industry and features aircraft in the US. Some of these are below, take a look at how aviation in America affected all of us – across the world. And continues to do so. But there’s a caveat, so please read to the end after some eyewatering beauties here. The caveat involves a confused moment in aviation which is being made more so by the President of the United States who has just announced a major overhaul of how Air Traffic Control is going to be managed in the future. He’s suggesting that the Federal control will be replaced by a private partnership which sounds fine, except for one major problem. The ATC network needs an overhaul but not a rebuild. Trumps plan is to completely and utterly change how its funded which is a very bad idea. Professional ATC folks I’ve spoken to who do this for a living are warning that if his plan is fulfilled, costs will be slashed and by that, read people. And people who are paid a fortune to keep aeroplanes from flying may move elsewhere, accountancy for instance. This means Trump may save airliners a bit of money initially but when safety leads to accidents, airliners go broke. So watch this space people. Privatising the system sounds all very Keynsian and forward thinking. Cutting it loose from the Federal system means less red tape, quicker upgrades, more technology. Sounding good? Trump is selling this now to passengers in the US as a way to reduce those odious queues, and improve scheduling. But that’s smoke and mirrors. All that will happen is that ATC costs will be trimmed and that’s a real danger for safety. The reality is the opposite. More control to airliners that have already begun pimping passengers, increasing costs, reducing the 30 000 Federal ATC workers, increasing queues and unsafe flying. Initially most in the industry have welcomed the new idea owing to the fact that the new system would eliminate taxpayer funding. But there’s no clarity on where the user fee will come from. As with other change, Trump is confusing privatisation with modernisation. Next generation systems such as automation and GPS or GNSS systems are long overdue. As with other baby and bathwater Trumpisms, this one may have a severe repercussions for the average Joe, including this one who takes off and flies.